Exciting Parallel Twin engine offers quick response, strong low-mid range performance and excellent fuel economy. 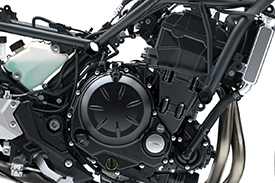 Liquid-cooled, DOHC, 8-valve 649 cm3 Parallel Twin with fuel injection delivers smooth, responsive performance, especially in the low and medium rpm ranges. 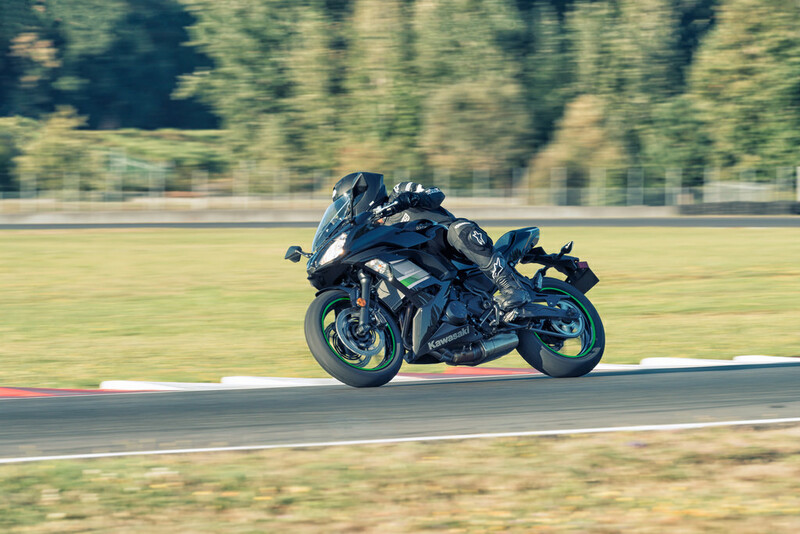 The settings result in a performance that favours speeds most used in everyday riding. 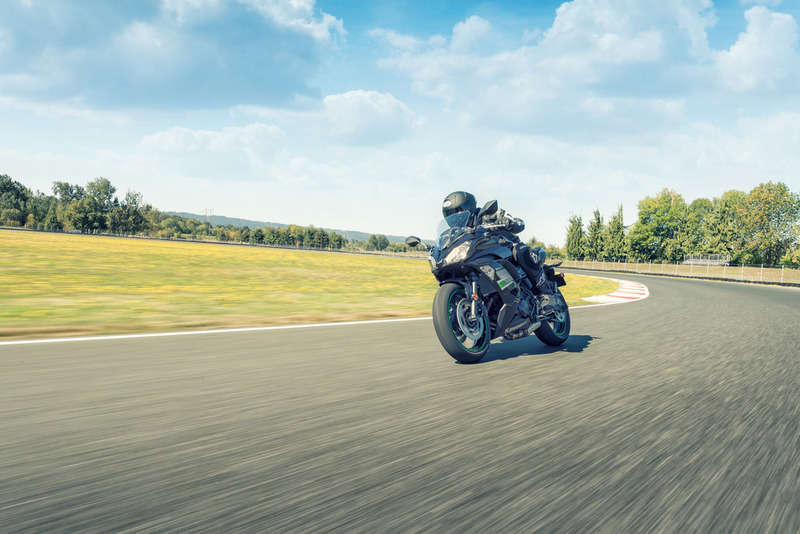 Corner pick-up is excellent: the powerful mid-range delivers a satisfying surge of acceleration and the flat, step-free torque curve and smooth engine response let riders open the throttle with confidence - at any rpm. The clutch uses two types of cams (an assist cam and a slipper cam), offering new functions not available on a standard clutch. This allows the total clutch spring load to be reduced, resulting in a lighter clutch lever pull when operating the clutch. When excessive engine braking occurs - as a result of quick downshifts (or an accidental downshift) - the slipper cam comes into play, forcing the clutch hub and operating plate apart. This relieves pressure on the clutch plates to reduce back-torque and prevent the rear tyre hopping and skidding. 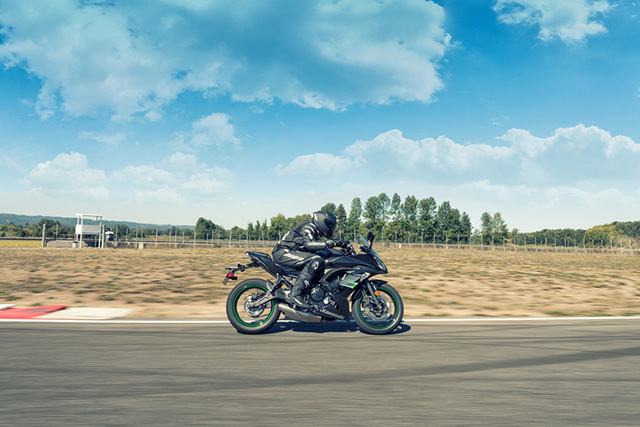 One of the key components to realising the Ninja 650's weight is the trellis frame. The frame weighs only 15 kg and contributes to the bike's light, nimble handling. The lines of the frame were made as straight as possible, and when bends were necessary their angles were made as small as possible, resulting in a design that disperses stress extremely well. Kawasaki's new in-house analysis technology was used to precisely determine the necessary pipe diameter, length and wall thickness to deliver the ideal lateral and torsional rigidity. Stylish star-pattern 5-spoke wheels contribute to light weight, while their high rigidity benefits handling. They also contribute to the bike's light looks. Low unsprung weight (thanks to parts like the swingarm, wheels, and hollow-type front axle) greatly contributes to the light, nimble handling. Silica-blend tyres offer both wet-weather performance and reduced rolling resistance, which contributes to the excellent fuel economy. 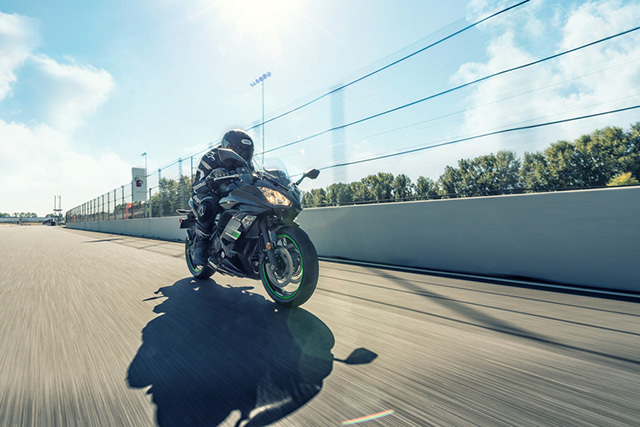 The Ninja 650's fine-tuned rider triangle provides both control and comfort. The low seat (790mm) and the bike's overall design ensure it is easy to reach the ground. Separate, raised handlebars mounted to the upper triple clamp offer control and comfort; they put the rider in a good position for sport riding. Mounting clamp for the handlebars is rubber-mounted to reduce vibration transmitted through the handle grips. Stylish upper triple clamp features strength-reinforcing ribs on its upper surface. Footpeg position offers a relaxed knee bend, contributing to rider comfort. The narrow frame and engine create a narrow overall package, allowing the rider to keep his or her knees and feet close together. Sporty front seat is slim at the front, facilitating the rider's reach to the ground. Seat bracket is rubber-mounted at the front to reduced vibration transferred through the seat. Mounting clamp for the handlebars is rubber-mounted to reduce vibration transmitted through the handle grips. 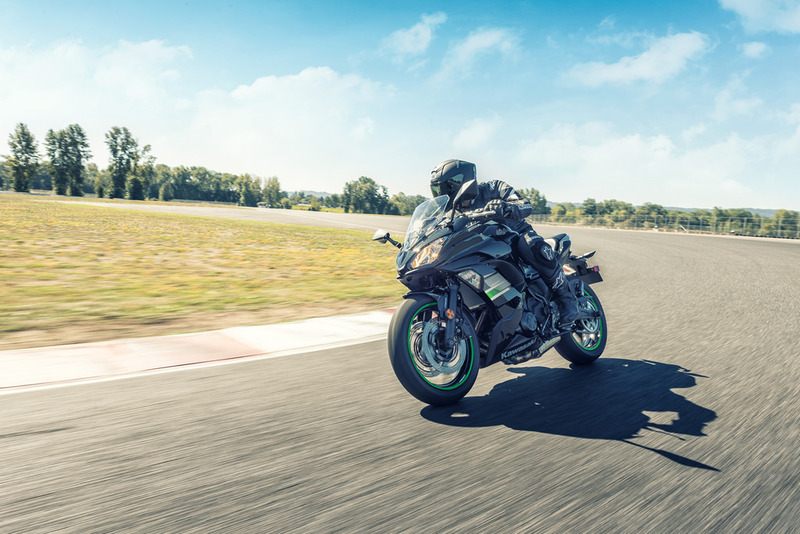 The aggressive visage is complemented by slim, close-fitting bodywork designed to give the bike a light, nimble image that reflects its sporty performance. 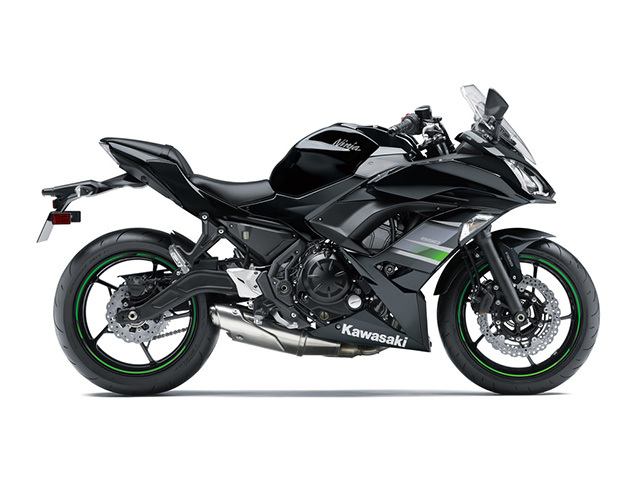 Aggresive upper cowl design inspired by Ninja supersport models exudes sportiness and contributes to a strong Ninja family identity. 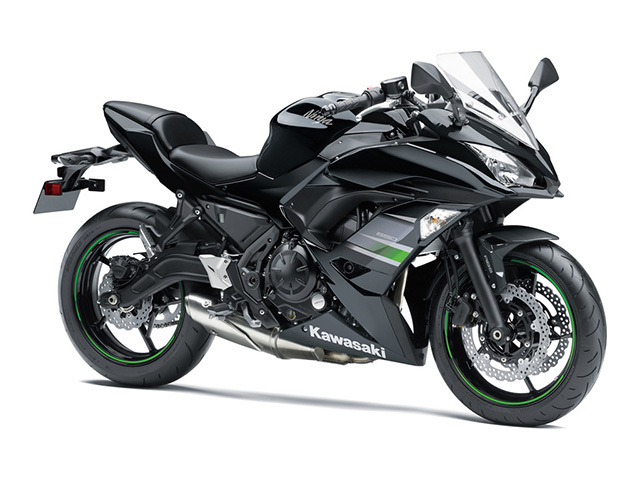 Sharp dual headlamp design contributes to the Ninja 650's aggressive face. 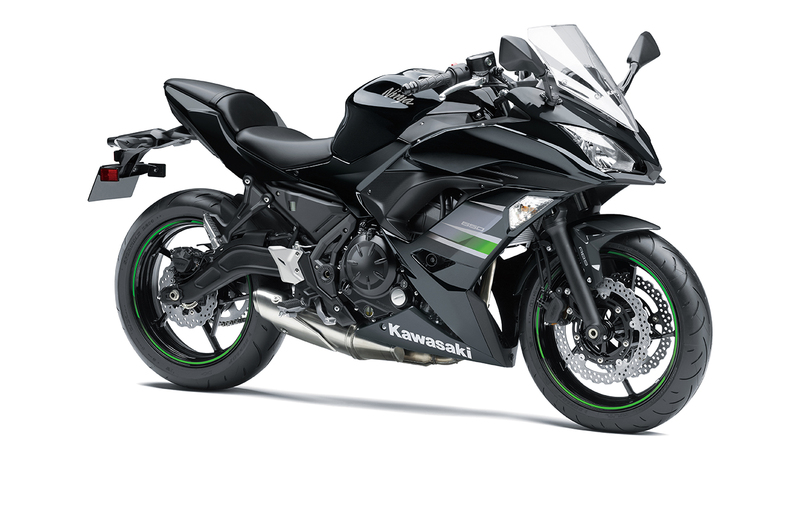 Chin spoilers below the headlamps are similar in design to those of the Ninja ZX-10R, further reinforcing the Ninja family resemblance. 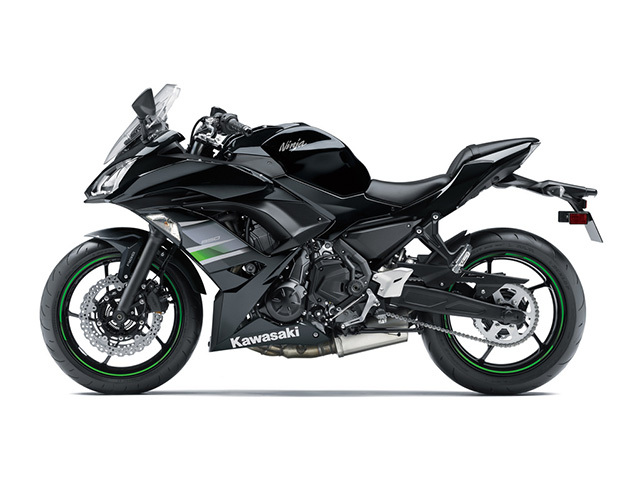 Fairings use black pieces to draw the eye in a horizontal line, emphasising the length of the bike to strengthen its supersport image. Compact front turn signals are built into the fairings. 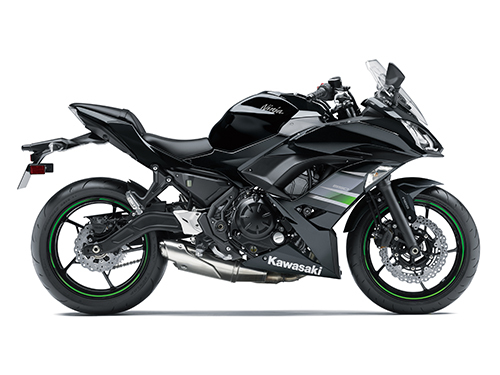 Slim lower fairings add to the Ninja style. Elegantly sculpted mirror stays position the mirrors for excellent rearward visibility. Analogue tachometer flanked by warning lamps, a gear position indicator combined with a new shift up indicator lamp, multi-function LCD screen, odometer, dual trip meters, fuel gauge, remaining fuel range, current and average fuel consumption, coolant temperature, clock and the Economical Riding Indicator. The tachometer's needle changes colour to indicate (rider-selectable) shift-up timing.